Remy Charlip said, "A picture book is a series of swinging doors in which every turning of the page brings you into another world." His book Fortunately was my favorite book as a child. It was one of those books that I had to find every time I went to the library with my mom and sister. I can still remember where the book was located on the shelf. Once I found the book, I would plop myself down right on the floor to read it. Fortunately, this book is quite amusing. Unfortunately, much trouble comes to Ned, the boy in the story. Fortunately, Ned is lucky and clever enough to get out of trouble. Unfortuately, he gets stuck in this pattern of events. Fortunately, everything ends up well in the end. My kids and I had fun orally making up our own Fortunately adventures using the good event/bad event sequence. It was interesting to see their brains work when it was their turn to take the story in another direction. I love when a children's book has an "author note." The author's notes I have read have provided more information about the subject of the book to give me greater understanding or have told the story behind the story. The author note for Mother, Mother, I Feel Sick; Send for the Doctor, Quick, Quick, Quick suggested performing the book as a shadow play. The illustrations of the characters throughout the book are silhouettes, but I didn't initially notice that the illustrations of the doctor at the hospital have him standing behind a white sheet. Remy Charlip mentions in the note that this is a "simple" activity to complete. However, it did take some planning to gather all the props, but overall it wasn't terribly difficult since we knew video editing was going to hide our mistakes! We hope you enjoy watching our shadow play as much as we enjoyed making it. This was a very fun birthday celebration for our family. I was beyond excited to share Fortunately with my kids. I added to the suspense by saving the Amazon.com package to open at bedtime. 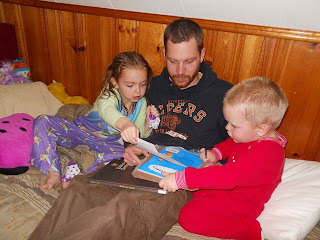 The kids were quite excited to open the package and share my favorite childhood book with me. I know this question gets asked a lot on children's book blogs, but "What is your most memorable book from childhood?" I would love to hear your stories! Feel free to share them as a comment to this post. Update: Today we had a Peanut Butter Party for lunch to celebrate Charlip's birthday. We used his book Peanut Butter Party: Including the History, Uses, and Future of Peanut Butter as a guide. 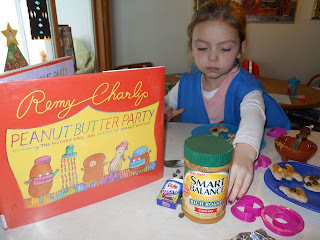 The book is full of fun peanut butter activities. We chose to cut letters out of slices of bread to spell our names. Then, we covered the letters with peanut butter, chocolate chips, raisins, and sprinkles! Hello - I'm the curator who organized "A Perfect Day" celebrating the life and work of Remy Charlip at Montalvo Arts Center. On Remy Charlip's birthday I saw your post and thought to myself, "I sure wish that I could show this to Remy in person." So today, through a series of coincidences, I delivered a package to him at his assisted care facility in San Francisco. And just before I left, I thought, "I wonder if I can find that birthday greeting/tribute with the shadow play of Mother, Mother, Come Quick..." and sure enough, I showed yours and your daughter's play to your favorite children's book author just moments ago. He was very, very pleased and laughed and laughed and laughed. We were both very impressed with both yours and your daughter's imaginations, and I was particularly taken with your daughter's recitation of her lines. Remy suffered a stroke a number of years ago and only recently was able to make a drawing for the first time (it will become an eyeglass cleaner for LA Eyeworks, a company that supports artists and who commissioned Remy even though the people involved knew that he might not be able to complete the work or make a new artwork for the cloth. Please know that your tribute has made Remy Charlip feel very loved. And I was able to show him that his beautiful, loving art and books will live on and on and on. I am still thinking about this! Thank you so much again!